My experience with the cheap Domotherm Rapid Basal thermometer including test report to the user manual, features and more. Again and again, I get the question, which is the cheapest and affordable Basal Thermometer. Today I would like to introduce it to you: It is the Domotherm Rapid. By the way, I started measuring my basal temperature with this thermometer in 2009. Like all thermometers, in this review, I will rate the functionality, operation and design of this thermometer. Features – What can Domotherm Rapid Basal Thermometer do? The Domotherm Rapid Basal Thermometer is very simple. It has a flexible tip that facilitates oral measurement under the tongue. In addition, it can store a temperature value so that the value measured in the morning can be recorded in a cycle sheet or an app even in the evening. After 30 seconds, as with almost all thermometers, there is a beep, here it is important to measure really 3 minutes and not to stop with the beep. This is the only way to achieve perfect accuracy. The thermometer then reaches its peak after 3 minutes and the temperature can be easily entered into an app or cycle sheet. I usually use an hourglass to measure time, which makes it easier for me to recognize – when the 3 minutes are really over. Operation – How does Domotherm Rapid Basal Thermometer work? The Domotherm Rapid Basal Thermometer has only one button over which all the operation runs. To turn on, simply press the ON/OFF button – If you have measured a value, the last value will be displayed briefly. If you press the switch-on button for a second, you get into measuring mode and can measure temperature vaginally, orally or rectally. The measurement method must be maintained within a cycle. After 30 seconds of measurement, the beep will sound, but that should not really bother you, you just keep measuring until 3 minutes later. You can then read and enter the value – DONE! When entering, the value must be rounded to half a degree according to the rules. The Domotherm Rapid Thermometer automatically switches off after 10 minutes – if the power-on button is not pressed beforehand. Of course, the value is saved until the next Power-up. If you have a fever and your measured value is above 37,50°C, then it beeps 30 times at short intervals (fever alarm). I find this particularly practical, which is why I like to use the Domotherm as a classic fever thermometer. The batteries can be changed depending on the Operating Instructions, there is a battery indicator that shows when the batteries need to be changed. We recommend a battery or thermometer change after a year at the latest in order to maintain the appropriate accuracy for the measurement. 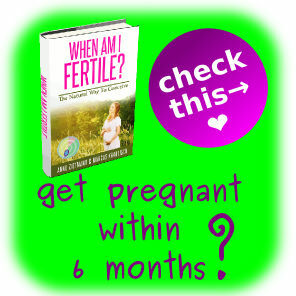 Since about 92% of women become pregnant with the Symptothermal Method within 12 months – most women with a desire to have children do not experience this. Unless they apply the Symptothermal Method to hormone-free contraception after birth or use the thermometer as a clinical thermometer after pregnancy. The thermometer should be cleaned after each measurement – I rinse the tip regularly with cold water and then dry with a suitable cloth. That always worked quite well for me. 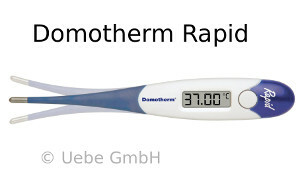 Well, the Domotherm Rapid is practical and the shape is just a normal Symptothermal Method thermometer. I do not find the colors blue and white suitable for a child desire thermometer. In the meantime, however, there are also other color combinations such as pink, white or yellow, white etc. Nevertheless, I like LCare much better. The thermometer fulfils its purpose in design but is certainly still air up. If you are looking for a cheap, easy-to-use Symptothermal Method thermometer, the *Domotherm Rapid Basal Thermometer is a good solution. I started measuring temperature – it serves its purpose. I especially find the simple operation quite suitable for beginners. The loud beep personally bothered me a lot – as I have little children and they wake up from it. I am also someone who likes to enter temperature values later – here a stored value was too little for me. For this reason, after some time, I searched for alternatives and found them with the Geratherm Digital. But the price performance ratio is correct in the Dorotherm Rapid Basal Thermometer, which is available between 5 and 7 euros. But I still use the Domotherm for fever temperature measurement – so the purchase was definitely worth it.